There is a separate committee who takes incharge of the "Quraan Khani" duing the Month of Ramadhan under the leadership of Moulana Ahmad Raza Khan Saahib Qibla. Top and consulation prizes are distributed to the Youths and Kids who participate in the Quraan Khaani. During Ramadhan, SMS Quiz is conducted daily by an individual Momin brother and at the end of the month the prizes are distributed for winners. There are few noted individuals who keeps us updated with up coming religious events, social events, important notices through sms alerts. Women are not far behind Men here. There are many committees in Ladies as well, who organise many activities. The Momineen and Mominaat especially the Youths are involved in all sorts of Religious and Social activities. Recently a Non Muslim from Chennai embraced Islaam in Bahrain. He accepted Islam as his belief and chose Fiqh e Jafariyya as his Fiqh (Islamic Jurisprudence)and thus became a Shia Muslim. The Youths of Perambur and other localities gave him a warm welcome. Our Moulana Ahmad Raza Khan Saahib announced this good news to the Momineen of Perambur in his Eid ul Adha (Bakrid) khutba on Tuesday 9th December 2008. On Sunday 26th of April 2009 at "Aastana e Ali ibn Abi Taalib (as)" (Madarasa) the Naumuslim got Married to a Shia Girl. The Nikah from bride's end was recited by our Chief Shia Khazi Govt of Tamil Nadu Moulana Muhammad Mehdi Khan Saahib Qibla. The Nikah from bride groom was recited by our Moulana Ahmad Raza Khan Saahib Qibla. Shukr Alhamdulillah the marriage was successful with the blessings of 14 Masoomeen (as) and with the help of our Perembur Momineen and Mominaaat. This News was also published in the Urdu Monthly Magazine of Shias "Islaah" (Lucknow) (November 2009/ Ramadhan 1430 A.H) Page # 53. This is just the beginning of this Mohalla and you can see more when you visit. Perambur is in North Chennai. Perambur is a place which used to be a bamboo forest a few hundred years ago, around the Huzur Gardens area, which currently houses the Simpsons Pvt. Ltd,. In Tamil, "Perambu" means bamboo and "oor" means city or place.Therefore its a Bamboo City. 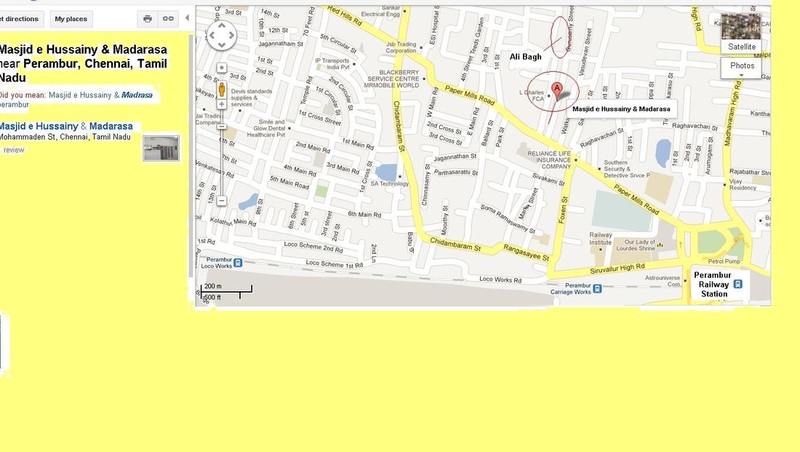 It is located 4 km from Chennai Central station. Perambur is 12 km from Thousand Lights which is the Markaz (Center) for Shias in Tamil Nadu. Initially Shias who were working as Southern Railway Employees settled down in Perambur. Slowly the Mohalla developed with Masjid and Imambaargah's. Perambur is served by three railway stations. They are Perambur, Perambur Carriage Works and Perambur Loco Works. It has a Railway Stadium and Perambur Bus Terminus. Recently a New Fly over has been constructed here. There are Malls, Schools, Colleges etc. The only thing Perambur is missing out is an "Airport" !!! Alhamdulillah with the Blessings of 14 Masoomeen (as) Perambur has one Masjid which is called as "Masjid e Hussainy". And the Mohalla e Perambur has many Imam Baargah's such as "Aastana e Ali ibn Abi Taalib (as)" (Madarasa) which is renamed as "Imam Ali ibne Abi Talib (as) Islamic Center", "Ali Bagh", "Abbasi Aashurkhana", and Nabi jaan Bhai's Aashurkhana. The Youths here are very active in Islamic, Social and Cultural activities the whole year. There are around 125 Houses of our Shia Momineen in Perambur Mohalla alone.There are so many committees/Anjumans in Perambur who conduct Majlises and Azadari during the Month of Muharram, Safar and till 8th of Rabi ul Awwal. On the ocassion of Eid uz Zehra i.e 9th of Rabi ul Awwal a grand event is organised by the respective committees in both Ladies and Gents seperately. Since 8th March 2009 Nehjul Balagha classes are conducted every Sunday after Zohrain Namaaz at Perambur mosque under the leadership of Moulana Ahmad Raza Khan Saahib Qibla. This Nehjul Balagha Committee is completely organised and run by Chennai Shia Youth (CSY). And every Saturday night there is a Fiqh classes conducted by Moulana Sahib in Masjid after Maghribain Namaaz. A Majlis e Aza is conducted every Saturday Night at "Abbasi Aashurkhana" by the respective committee members. Imam e Asr (as) Committee which is also known as Qidmatgaar Committee is famous for its Social and Religious services in Ramadhan, Muharram, and during other religious and social occasions in Perambur.